I was in Holland & Barret recently and was quite surprised to find how expensive almond butter is, especially as upon reading the ingredient list on the back of the jar I discovered that it is 99.5% almonds and 0.05% salt! Surely this should be easy and cheap to make myself I thought? 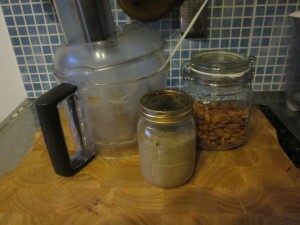 Well, after a quick Google I found out that it is incredibly easy to make, so I have included instructions of how I made a jar of it myself, along with a few pictures to prove just how easy it is. Firstly I should explain, for those who don’t know, exactly what almond butter is. Quite simply it’s the almond equivalent of peanut butter, the stuff that kids (and adults) love to spread on their sandwiches. I suppose some of you may be asking, ‘why make almond butter at all if we’re not eating bread on the Paleo diet, after all, what else can you do with it?’. 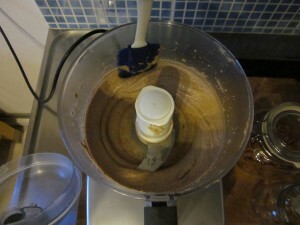 The answer to that question is ‘Paleo baking’, a lot of paleo baking recipes use almond butter or some other nut butter. I am going to make some made paleo protein bars which is why I have made my jar of almond butter but I have dipped some 90% dark chocolate in it already & it tastes great. 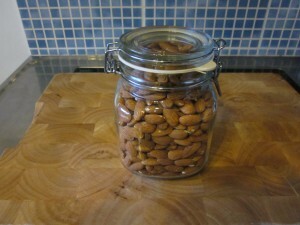 You can also roast the almonds in the oven on a low heat to give your almond butter a slightly nuttier flavour. 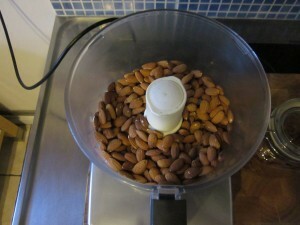 The method is simple, put some almonds in a food processor, turn it on and wait for the nuts to transition from a bread crumb like consistency to a dough like consistency and finally to a glossy smooth paste. All you need to do is occasionally scrape the sides of the bowl down with a silicone spatula to ensure the whole mixture is smooth throughout. 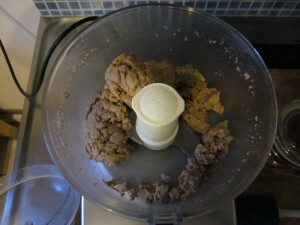 NB: For me the almond butter took about 18 minutes to make, I have a powerful food processor & it seemed to handle the job well but it’s worth checking your instructions to make sure you don’t burn out your motor. If in doubt turn it off & wait for the motor to cool down before continuing. 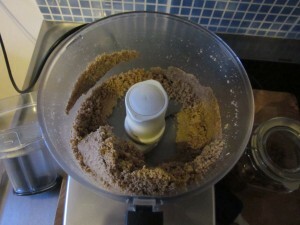 I recently broke a food processor attempting to make almond butter. I’m looking for a new one and not sure how powerful it needs to be. You mention in your article that yours is a powerful one, how many watts? Would 1000w processor be ok? More powerful than this they get a bit too pricey. Hey Mary, that should be more than powerful enough, but it is the quality of the food processor that really matters. Try to get the best one you can afford and definitely a reasonable brand and it will be a good friend that is with you for some time! Jase is the expert here and he is on holiday in Europe but happy to take a look if you have a model in mind?